The Paragary Restaurant Group’s chefs, owners, bakers, bartenders, marketing team, managers, etc. all enjoy reading books that help them learn more about their particular profession, the jobs of those around them, or the restaurant industry in general. Since the PRG team has discovered many fantastic books within the restaurant/food genre, we thought it would be a good idea to share our favorite books with you each month. Enjoy! Why are you recommending this book? It’s an incredible story about one of the most gifted chefs in the country and the world. Both established chefs and aspiring chefs. Or, anyone wishing to learn more about what goes on inside the mind of a great chef. I’m always interested in reading about people who are at the top of their chosen profession. In this case, I found the book even more compelling because I work in the same industry and could draw direct comparisons to some of my own experiences. Another reason I chose the book, was because I recently had the opportunity to have dinner in Chicago at Grant Achatz’s restaurant, Alinea. The meal was a 7-hour marathon that included 32 courses, 13 different wines and an astonishing array of innovative culinary concepts, techniques and flavor combinations. I wanted to learn more about what led Grant to where he is today. Tell us something interesting about Life, on the Line. I found the book interesting on many different levels, not the least of which was Grant’s relationship with his business partner, Nick Kokonas and their approach to developing the concept of Alinea. Their attention to the smallest of details and their commitment to create something that would be truly extraordinary was inspiring. What makes this story truly amazing is, at the height of his career, Grant was diagnosed with stage four cancer of the tongue. Subsequently, three different specialists told him that the only option for treatment would include removing his tongue, part of his jaw and his lymph nodes, effectively eliminating his ability to taste. It was only after a fourth doctor’s recommendation for an aggressive treatment using radiation and drug therapy that gave him any hope of a recovery that didn’t include ending his career and leaving him horribly disfigured. During the treatment, he lost his ability to taste but continued creating new dishes, relying on his sous chefs to help execute his ideas. 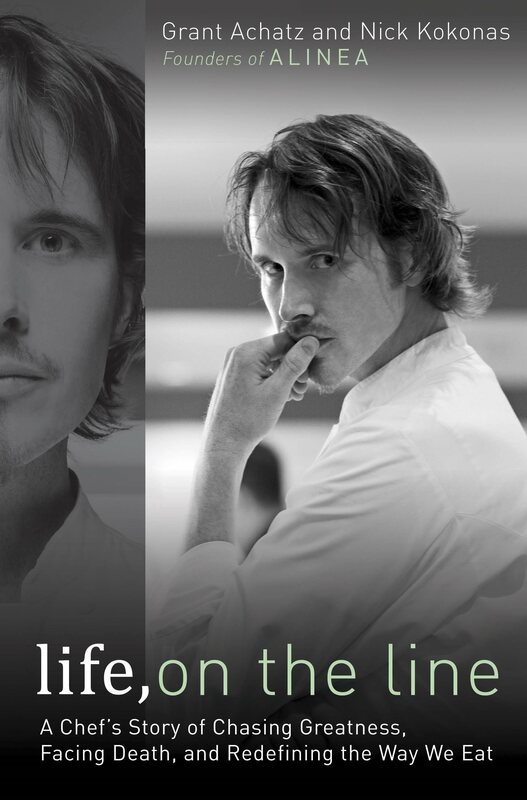 In this curious memoir, chef Achatz and his business partner, Kokonas tell of their Chicago restaurant, Alinea, as well as his cancer diagnosis and recovery. Achatz grew up in Michigan in and around restaurants, the only child of a troubled marriage who spent an otherwise contented adolescence around kitchens. He eventually attended the Culinary Institute of America and studied with Charlie Trotter and Thomas Keller with whom he began developing both his palate and culinary vision. He returned to Chicago, where he met Kokonas, who became his business partner in 2005, when they opened Alinea. As Alinea evolves from drawing board to reality, the narrative alternates between the two men’s voices. They discuss finding the right team of chefs and dealing with Achatz’s diagnosis with stage IV tongue cancer. The various narratives–childhood, professional development, Alinea, Kokonas, illness–have individual strengths, but the whole feels oddly disjointed and in places, such as the section on the restaurant’s genesis and development, turn into more of a business how-to. Nevertheless, the authors duly convey their passion as well as a solid business philosophy. Have you read Life, on the Line? If so, please leave a comment below and tell us what you thought about the book.